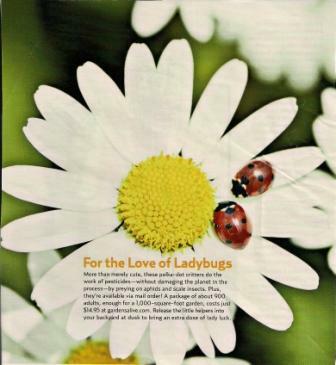 So, did you know that Ladybugs are more than merely cute, these polka-dot critters do the work of pesticides....without damaging the planet in the process....by preying on aphids and scale insects. Plus they're available via mail order! A package of about 900 adults, enough for a 1,000 square foot garden, costs just $14.95 at Gardens Alive. Release the little helpers into your backyard at dusk to bring an extra dose of lady luck. I found this very interesting article in the April issue of Country Living, written by Catherine Strawn. I hope you enjoyed this lil tidbit of Ladybug info!